The Acura MDX comes equipped with either a 290 hp 3.5-liter gasoline V6 or a hybrid drivetrain producing a combined 325 hp. Both offer good consumption and performance levels although rivals tend to be even more economical. All-wheel drive is an option on the gasoline car while a 9-speed automatic transmission is standard. This SUV offers comfortable three-row seating and a decent ride quality, cabin materials let the side down though and although it is generally well equipped, you will have to pay extra for equipment such as parking sensors that comes standard on most rivals. 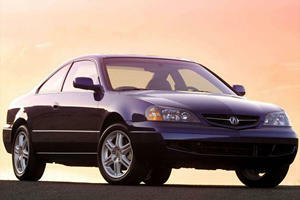 Acura is a brand caught between two worlds, its past and its present. Its past is an enthusiast’s dream of the Integra Type R, NSX and even the first TLX with its sweet, sweet manual transmission. Its present is that it has dwindled to a shadow of its former glory, selling luxury commuter appliances based on an excellent value proposition and sales dropping to a six-year low in 2017. Aside from the NSX, which only sold 581 units anyway, every model in its lineup saw sales fall in 2017 compared to the previous year. Even its bread-and-butter SUVs, the RDX and MDX, dropped off slightly when SUV and luxury crossover sales are exploding. What to do, what to do? 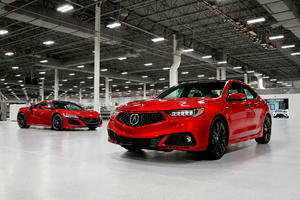 Well, for starters, Acura has just taken the wraps off a , introducing an all-new interior theme and infotainment, instantly making interior seem somewhat obsolete despite a relatively recent refresh (with yet another new grille and some equipment updates). A hybrid was also added to the lineup, but apparently nobody cares because it hasn’t moved the needle sales wise, just over 1,800 finding homes in the US. Anyhow, let’s ignore the hybrid just like the rest of America, and focus on the standard V6 that you are likely interested in. The V6 is Honda’s go-to big gun, 3.5 liters and direct injected with variable timing, making 290 horsepower and 267 lb-ft of torque the old fashioned way at high revs. Peak torque arrives at 4,700 rpm and peak power at 6,200 rpm, which is pretty heady territory for an SUV these days. In an era of turbo torque and boosted sixes, 290 horsepower doesn’t sound all that impressive for a large-ish midsize SUV, but the MDX keeps weight in check at 4,257 pounds when competitors like the X5 and top 4,600 lb and the Q7 porker is almost pushing 5,000! One area where they probably save weight is sound insulation, because the MDX is not the quiet, serene cabin you might expect of a large luxury vehicle. Wind and road noise aren’t too intrusive, but the suspension tends to crash and clank over rough roads, even though it does the job of absorbing the impacts. The engine isn’t the sweetest sounding V6 you ever heard, wheezing a bit as it’s pressed, not quite the throaty growl the Germans pull off, nor the screaming VTEC yowl of old Hondas. 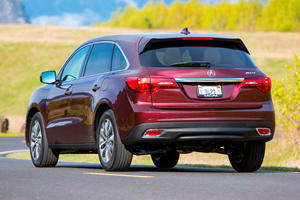 The MDX wins at efficiency though, rating a thrifty-for-its-size 26 mpg for highway driving, 19 in the city and 22 combined. In our week with it, we finished at 19.6 mpg at the tail end of winter, which for my driving habits and routine is quite good. Still, the power is there, and it gets up to highway speeds in about six seconds, and the new 9-speed transmission shifts quickly and unobtrusively. While paddle shifters are standard, you won’t need them because the transmission does well enough when left alone, and the Dynamic Mode sharpens throttle and transmission response and firms up steering without being hyper. Regular comfort mode is just a bit too sloppy, especially the super light steering, so sport quickly became our default. Note that suspension will firm up in certain driving situations, but does not take on a firmer setting with the sport mode. It’s well tuned for everyday driving, but if you get a little too carried away believing the commercials hyping Super-Handling All-Wheel Drive (SH-AWD), you might be disappointed. There’s a bit more body roll than I would expect of a premium, nominally sporty crossover. Although the wheels are 20-inches, they have generous sidewalls to take the sting out of impacts, but the winter tires outfitted on our tester gave up handling prowess for snow traction. It still has a nice balance to it, but overall it was disappointing dynamically, and much more of a high-riding, ho-hum family hauler than the surprising and athletic crossover it had been in earlier generations. In particular I remember my first drive in the second generation MDX, and the then-new SH-AWD just blew my mind and eclipsed the Germans for dynamics at the time. These days, where it eclipses the Germans is value. Just as the Q7’s weight is staggering, so too is its price tag, with any Teutonic seven-seater a pricey proposition. The Acura MDX starts at $44,200 in base front-wheel drive trim with a $940 Destination charge, and there’s plenty of standard equipment, but at that price you should – it’s what the MDX used to be: dynamic, luxurious and great value. The MDX in $58,150 Advance trim we drove, however, is still practical and luxurious, especially with the Advance package, the Milano leather and Olive Ash wood trim offering a feeling of warmth in the high-tech cabin. The two stacked screens take some getting used to, the top screen with navigation, audio and phone functions controlled by the large scroll knob, and the lower touchscreen controlling climate and also audio. It seems a bit confusing at first, and we didn’t like how the seat heater controls take two presses to activate, but you get used to it, and I, for one, appreciate how it helps declutter the center console. The transmission shifter is another feature that also takes some getting use to but frees up real estate for generous at-hand storage and a large armrest hiding a massive storage compartment. Steering wheel controls also mean you can skip reaching over to the center stack for most things, and also houses the adaptive cruise, which has low-speed follow abilities. It is not the smoothest system among competitors, and the forward collision alert is a bit sensitive, but hey, better safe than sorry. In Advance trim, the second row goes from a bench for three to two captain’s chairs (making it a six-seater instead of the standard seven) that are heated, with a wood-trimmed console containing storage and cupholders, charging ports and rear temperature controls. And with the press of a button, the seat back flips forward and the seat slides forward to allow easy access to the third row. One misstep however, is that the doors don’t open very wide, making getting in and out or child seat installation a bit more difficult – kids probably won’t notice, but older folks might. The third row is passable for this size vehicle, but not a place any adult would want to spend much time in. Finally, cargo space is modest at 15 cubic feet with all three rows up, 38.4 cu. ft. with the third row dropped, or 68.4 with all seats folded, which offers a nice, flat surface all the way to the front seats. However, the third row splits 50/50 and second row also splits and folds, so there are a variety for different layouts you can go with to carry awkwardly shaped cargo and passengers simultaneously. 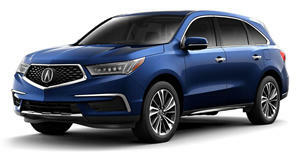 Unfortunately for Acura, although the MDX is a good, safe SUV, and fairly safe bet for reliability and resale, it just seems incredibly dull compared to the competition. ; the is a Mercedes, which everyone wants; (and people will pay the steep premium for it, or buy the smaller Macan); the Lexus RX might not have the seven seats yet, but it is reliable, funky looking, and comes across as the better value; and no doubt the popularity of the stylish Volvo XC90 has been eating the MDX’s lunch. From the other end, Acura needs to watch out for Mazda’s CX-9, which in Signature trim is just as luxurious and drives better than the MDX. Is the MDX suddenly a bad vehicle? Nope, there’s actually a lot going for it, and it may simply be a victim of its longevity – it’s just not the latest shiny new thing that people want, and as you can see from above, there are lots of shiny new things for people to pick from in this segment and price point. More than 323,000 MDX crossovers recalled for potential brake light failure. Guess who the airbag supplier was. У нашей компании полезный интернет-сайт на тематику www.iwashka.com.ua.